Since 2004 we have had the privilege of working with hundreds of wonderful young flutists and chamber musicians who participated in our education programs. Alumni of our education programs have won several national, regional, and California state competitions, including the National Flute Association High School Soloist Competition, MTAC's VOCE Intermediate and Senior Chamber Music Competition, and MTNA Senior Soloist Competition. 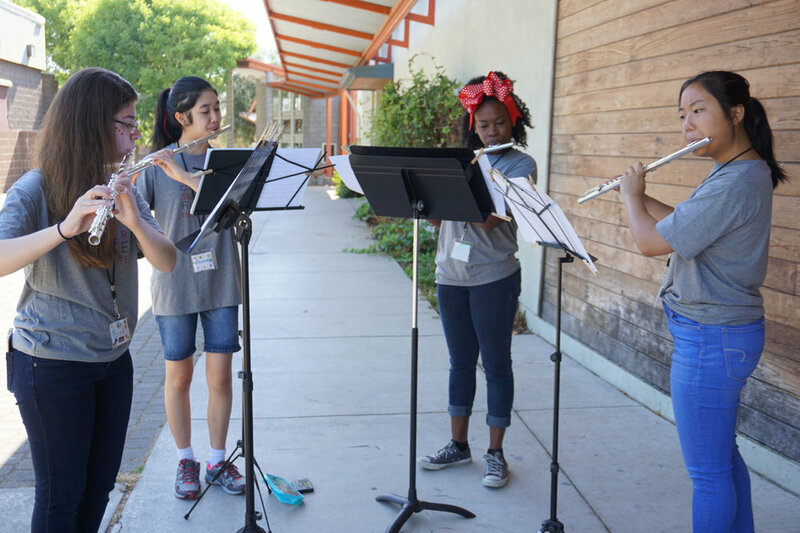 They've held positions in San Francisco Youth Symphony, California Youth Symphony, El Camino Youth Symphony, and San Jose Youth Symphony, National Flute Association High School Flute Choir Competition, and they have been accepted to top-ranked universities across the nation. Several flutists have gone on to become professional flutists as well. Chamber music teaches communication, tolerance, empathy, and leadership -- all essential tools as students develop in a musical setting and as they participate in their communities. Because there are no conductors and only one player on each part, students learn decision-making and effective communication in a small group setting. Additionally, students hone leadership and build confidence knowing they are responsible for their designated part. As students take these skills back to their school classrooms and beyond, not only do band directors see a direct benefit from the rise of skill level, but communities benefit from young citizens’ improved problem-solving skills. In chamber music, everyone has a say, and everyone has an equally important voice. We have stressed these concepts to our students as they learned to play music together and took these skills out into the world. The students also taught us so much in return and we are glad to see that the future is in their capable hands. After 15 years, and with full hearts, we’ve decided to further our educational mission in other ways and will no longer continue the Areon Chamber Music Institute, Areon Summer Flute Institute, and International Chamber Music Competition programs. We will continue to coach chamber music and work with flutists and composition students on tour and in our university residencies. Song of the Bard by Ralph Guenther, Concerto in A Major by J.B. Boismotier (Mvt. 1: Allegro, Mvt. 2: Andante, Mvt. 3: Vivo). Performed by Luisa Brown, Jessica Chen, Jasmine Deng, Kaylan Huang, and Kalie Oku. Started in 2005, the International Chamber Music Competition was an integral part of Areon's mission to make flute chamber music an equal voice in the chamber music world. Each division serves our mission by involving instrumentalists and composers in our goal to leave a new and diversified chamber music legacy. The Composition Division of the International Chamber Music Competition is now called the Areon Flutes Commissioning Prize. The Performance Division encourages young musicians to explore chamber music and its possibilities. It provides a goal for students seeking to foster their love of music and helps to build confidence while nurturing their development as overall musicians. By encouraging students at young ages to participate in chamber music, we hope to build a lifetime of appreciation and love for the genre. Judges: Claudia Anderson and Jill Felber, acclaimed members of ZAWA!